CHD2. This is the Epilepsiome page for CHD2, a common cause of an early-onset epileptic encephalopathy. 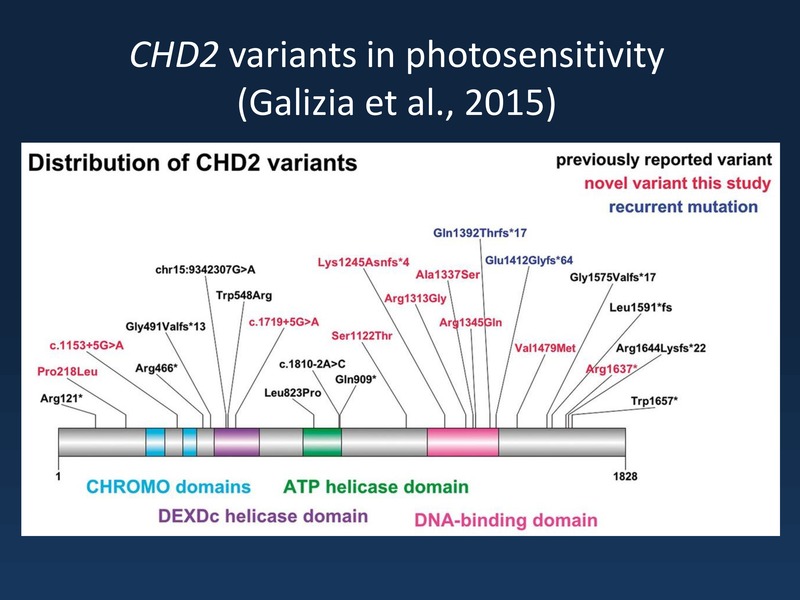 Exquisite environmental photosensitivity is the hallmark of CHD2. In a nutshell. Mutations in CHD2 are one of the more common causes of epileptic encephalopathy. This important role has only been recognized since 2013, so we are still learning about the phenotypic spectrum and mechanism of CHD2 mutations. The most commonly reported CHD2 phenotype has Dravet features (early onset, some have febrile seizures, myoclonic seizures), Lennox Gastaut features (multiple seizure types including tonic seizures) and Doose features (photosensitivity, myoclonic-astatic seizures). However, it is the exquisite environmental photosensitivity that is the hallmark of the epilepsy associated with CHD2. The precise function of CHD2 is as yet unknown, but it encodes a large protein, intolerant of variation, for which we currently have no functional assay to estimate the pathogenicity of variants. Epilepsy. Many patients with CHD2 mutations have an onset of seizures between age 6 months and 4 years. Affected individuals have multiple seizure types, with a predominance of myoclonic and absence seizures. Other seizure types include drop attacks and rapid onset of multiple seizure types associated with generalized spike-wave on EEG. Seizures may be fever-sensitive. A seizure type observed in several patients has been called ‘atonic-myoclonic-absence seizure,’ and is characterized by a progressive seizure pattern with an abrupt head nod and atonia followed by a myoclonic absence phase and progression to a ‘ratchet-like’ tonic abduction of the upper limbs. Clinical photosensitivity, with seizures triggered by photostimulation such as a flickering light or television, was described in 9 of 12 patients in one study and may be a distinguishing feature for such early-onset epilepsies. CHD2 mutations are also seen in common epilepsies associated with photosensitivity and in 3 of 36 patients with the most photosensitive epilepsy syndrome, eyelid myoclonia with absences. Developmental delay and autism. Patients with CHD2 mutations also have developmental delays that are often present prior to onset of seizures. All patients with the epileptic encephalopathy phenotype reported to date have intellectual disability, though the range is from mild to severe, and some patients exhibit autistic features or other challenging behaviors, including aggression. Developmental delay does not always accompany the more common photosensitive epilepsies with CHD2 mutations. A CHD2 mutation has been reported in a least one patient with intellectual disability without a know history of epilepsy. It remains unclear whether or not this patient will develop epilepsy at a later time or if some patients with CHD2 mutations do not develop epilepsy. Other features. Patients with microdeletions of CHD2 and nearby genes can also have additional features, including truncal obesity, scoliosis, neonatal hypotonia and facial dysmorphism. However, it is unclear whether these findings are also relevant to patients with CHD2 sequence variants. Schematic of CHD2 illustrating its functional (chromo, DEXDc, DNA-binding and ATP helicase) domains, the location of previously-reported variants and the unique variants in both cases and controls identified in this study (modified with permission from http://brain.oxfordjournals.org/content/early/2015/03/16/brain.awv052). Mutation Spectrum (Type and Location). Thus far, the majority of clear disease-causing mutations have been truncating (frameshift or nonsense) variants. Microdeletions (including CHD2 and surrounding genes) and missense and splice site variants have also been reported. The pathogenicity of many of the identified missense and splice site variants has not yet been clearly proven, as there is limited genetic (e.g. segregation or de novo status) and functional data available for most of these variants. Variants have been reported throughout the CHD2 gene and are not restricted to a single domain or exon. Genotype-Phenotype Correlation. No clear genotype-phenotype correlations have been reported, though the number of patients described is still small. Mutations associated with eyelid myoclonia with absences, or with the more common photosensitive epilepsies are usually missense. Gene level interpretation. First, it is important to establish the strength of the evidence showing that the gene is associated with epilepsy. Some genes may only have one variant reported in a single individual with epilepsy, while other genes may have multiple variants reported in many large families with an autosomal dominant pattern of epilepsy. Variant level interpretation. When reviewing the significance of a variant, it is important to consider the impact on the gene and the presence of the variant in previously described patient and control populations. Many clinical genetic testing laboratories classify genetic variants into different categories, ranging from benign to pathogenic. Variants that are common in control populations and would not be predicted to have a major impact on the gene/protein are generally classified as benign. Variants are more likely to be classified as pathogenic if the variants are rare or not present in the control population, reported in multiple individuals or families with disease, and likely to have a higher impact on the gene/protein based on the type of mutation or functional studies. Variants with uncertain or limited available evidence may be classified as variants of uncertain significance (VUS), indicating that further information is required in order for the variant to be further defined. In some cases, testing additional family members can be helpful, as it allows the lab to determine whether or not the variant was inherited (versus de novo) and how the variant segregates with disease in the family. Sometimes further classification of a VUS requires waiting for the identification of additional patients or families with similar or nearby variants. Inheritance, Penetrance & Prevalence. Many, if not all, clearly disease-causing CHD2 mutations have been de novo. Some variants have been reported to be inherited from unaffected parents, raising the possibility of incomplete penetrance or variable expressivity, but no cases of definite autosomal dominant inheritance or inheritance from an affected parent have been reported. The prevalence of CHD2-associated disorders is unknown. Haploinsufficiency. Most of the well-established disease-causing mutations that have been described are heterozygous truncating mutations or whole gene deletions, suggesting that haploinsufficency is the mechanism of disease. The disease mechanism of missense mutations is unknown. Chromatin remodeling. CHD2 encodes the chromodomain DNA helicase binding protein 2. CHD2 and additional members of this family of proteins are responsible for remodeling chromatin, which controls the three-dimensional architecture of the genome and gene expression. 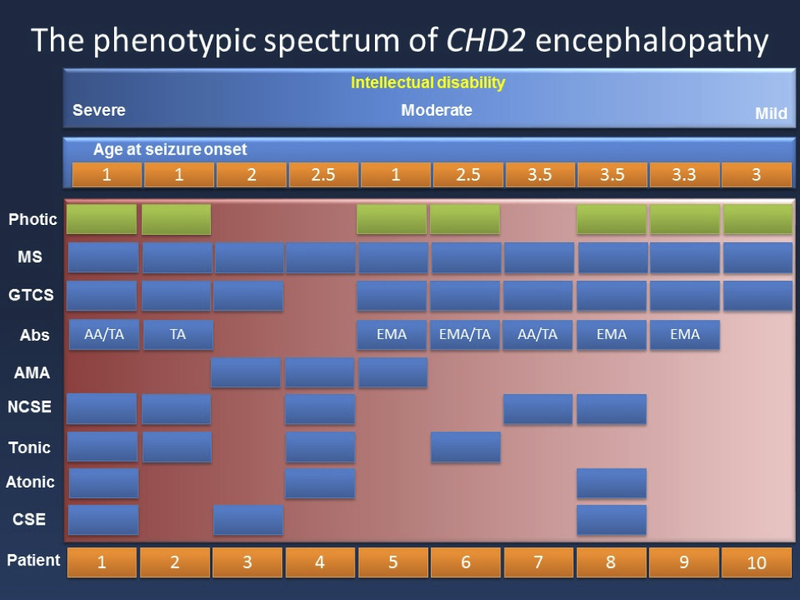 CHD2 is ubiquitously expressed, and it is not yet known why mutations cause epilepsy and developmental abnormalities. It is likely that haploinsufficiency of CHD2 leads to altered expression of downstream genes that are important for normal brain development and function. Mice. According to Kulkarni et al (2008), mice with complete disruption of Chd2 (homozygotes) show embryonic/perinatal lethality, while mice with partial disruption of Chd2 (heterozygotes) have pronounced lordosis, kyphosis, absent or hypoplastic subcutaneous fatty tissues, and growth retardation. Epilepsy has not yet been described. Zebrafish. Zebrafish with partial loss of Chd2 function (i.e. Chd2 partially knocked down via morpholino) have abnormal movements, epileptiform discharges, and photosensitivity, as well as multiple developmental abnormalities not reported in humans with CHD2 sequence mutations, including body curvature, microcephaly, and stunted growth. Recurrence Risk. All established disease-causing variants identified thus far appear to be de novo or sporadic and no larger families with CHD2 variants have been identified. Although not yet reported, germline mosaicism of CHD2 mutations is possible, making the recurrence risk for families with one child with a CHD2 mutation higher than the general population risk. Therapy. Thus far, there is no specific recommended treatment regimen for patients with CHD2 mutations. Stay tuned for an update from our CHD2 experts. Family page. The CHD2 patient community maintains an active Facebook page that researchers and families can join. The Facebook page is managed by Melanie Brazil, who will introduce you to the community if you would like to join. Research studies. The scientific community is currently actively studying CHD2 and its role in human disease. The CHD2 Epilepsiome team is happy to facilitate if you have questions or a specific interest in this gene. Liu et al. 2015. Human CHD2 is a chromatin assembly ATPase regulated by its chromo- and DNA-binding domains. J Biol Chem 290(1):25-34. Just 2 hours ago we found out our 4 years old son suffer from CHD2 mutation, and it was a good read here. We will be happy to share our a data with researcher in cases required.